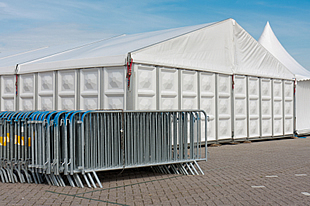 If you're holding an event that's likely to attract large crowds of people then it's absolutely essential to use temporary fencing and crowd barriers. Putting up barriers can help you direct or control the movement of people around your event, prevent crowding too close to a stage or platform, or it can simply cordon off areas where you don't wish the public to go. We also supply temporary security fencing, which can be effectively used to help protect sites and property from unauthorised access. At MDS Scaffolding we offer a totally flexible hire service. We can supply barriers or fencing that you can erect yourself, or if you prefer we can provide an experienced team to erect and remove it for you. We can also provide advice on the correct and safe set-up of fencing around your event. To find out more about any of our scaffolding services please contact us today on 01772 464033.. Copyright © 2012 MDS Scaffolding Ltd . All rights reserved. Registered in England & Wales.